If your labret piercing isn't work-place friendly, you may want to find some ways to hide a labret piercing from your boss. While facial jewelry can be more difficult to hide than other body piercings, there are ways to minimize the site. A labret piercing refers to any barbell piercing in the face or lower lip. Sometimes referred to as a lip stud, the labret can be located anywhere to the side of or below the lower lip and can even appear in pairs. While the simple stud of the labret can be less noticeable than a large lip ring, the fact that it's located on your face may make it hard to hide from a boss or disapproving grandparent. Luckily, there are ways to hide a labret piercing from view. Depending on how close to you the person you are hiding the piercing from gets, some of these methods may work better than others. A labret retainer is an acrylic jewelry piece with a flat end, rather than a stud. The acrylic can be clear or flesh colored and is much less noticeable than a metal piercing. If you are planning a piercing that will need to be hidden during the healing stages, ask the piercer to place a retainer instead of the initial jewelry. There are multiple sizes, shapes and styles of retainers on the market; you may want to try a few different varieties to see which one works best for you. 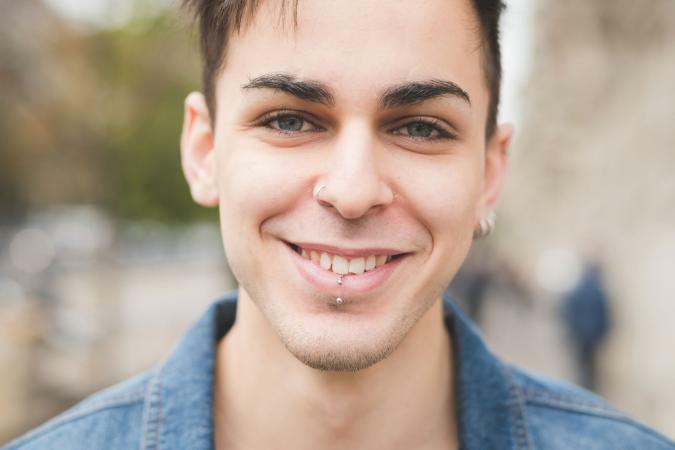 Depending on the placement of the labret, you may need a retainer to curve, be larger or smaller than another, so do your research and see what or where the retainer is recommended for use. The retainers themselves are relatively cheap at only a few dollars a stud; order a variety, if this is going to be a long term solution for you. If you only need to hide your labret piercing for a short time, consider turning the stud around. Place the bulb end inside your mouth and the flat end on the outside. Cover the metal with a facial concealer that matches your skin tone. Be sure to wash the jewelry very well before turning it around again if you choose this option. If the piercing only needs to be hidden for a day or so, consider removing the stud and covering the hole with a small bandage. Very small self-adhesive bandages can be worn comfortably on the face; most people viewing it will assume a cut rather than a piercing. If you are considering a piercing and know you will have to hide it regularly for any reason, consider waiting to get the stud. Piercings are a way of expressing yourself, and you may be better off waiting until your lifestyle can match your personality and allow you to express yourself without consequence. Piercings may need to be hidden from time to time during the course of a lifetime, but setting out to pierce and hide from the start may be a recipe for disaster. Do not attempt to change out a new stud for a retainer or turn around an existing stud until the healing process is complete and the stud can be safely removed - around three months. Removing a fresh stud could set you up for infection or premature closing of your new piercing. Think carefully before getting your labret pierced and remember that while there are ways to hide a labret piercing if you have to, it's better to let the stud show if possible.